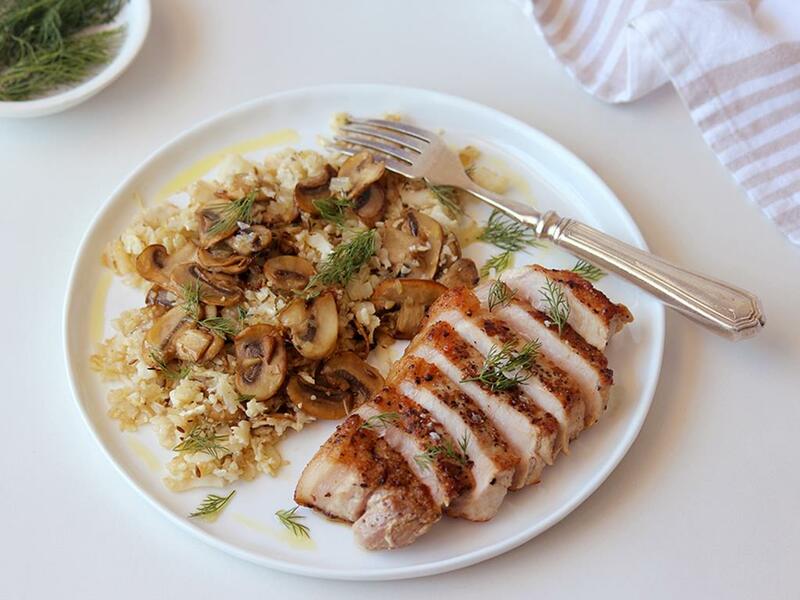 Mushrooms & cauli-rice sautéed with thyme, cumin & onions, served with pork chops & topped with fresh dill. Pork chop: Place a dry pan on medium-high heat. Cut perpendicular slits (about 2cm apart) all the way along the fatty edge of the chop to prevent it from curling up in the pan and rub both sides with olive oil. When the pan is hot, add the chop and sear for 3-4 minutes a side. Hold the chop on its fat edge for 1 minute to crisp it up. Remove, set aside and keep warm. Cauli-mushroom mix: Place a pan on medium-high heat with a drizzle of olive oil. Add the onion with a pinch of salt and cook for 5 minutes until golden and softened. Remove and set aside. Using the same pan on medium-high heat, add a drizzle of olive oil and a knob of butter. Add the mushrooms (in batches, so you don’t overcrowd the pan) and cook for 5-6 minutes until golden. In the last couple of minutes, add the thyme, garlic and cumin seeds, then mix in the onion and cauliflower. Sauté for 4-5 minutes until the cauliflower is cooked. Add the chilli flakes (if you like a little spice) and season with salt and pepper. Serve the pork chop with the cauli-mushroom mix and top with fresh dill.